As a bird photographer, I've continued to get the question, “I have two birds in the photo, but only one is in focus. How do I get both birds, particularly the eyes, in focus?” A fair question. When photographing birds, we need fast shutter speeds which typically goes hand in hand with bigger apertures and more light (see: the exposure triangle). This also means that if one of the birds is not on the same focal plane (either in front or behind the bird we focused on) it will be soft or not in focus. With preplanning before the shoot and using a few post processing tools within Photoshop, a photo with 2 birds (animals or people) can be in focus. My subject? 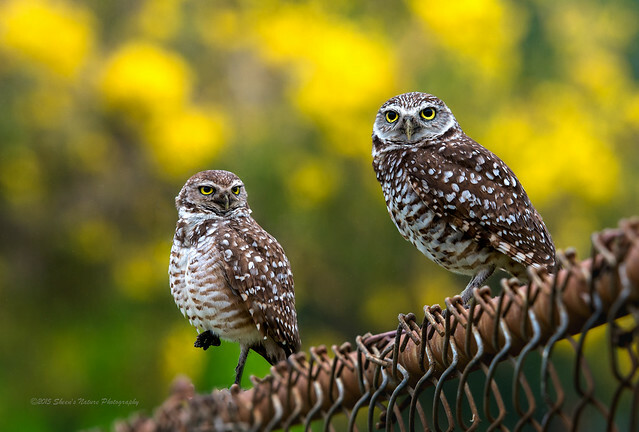 A pair of burrowing owls. Here's is the male. I believe he became quite bored with me being there as he started yawning while looking at me. Is that cheating? Some say yes, some say no. It's a matter of personal preference. However, if entering your photo in a contest, be sure to understand the rules as some may or may not allow this process. You photographed both birds, the composition is solid and the depth of field works. The best of both images can be blended together to create your desired photograph. So if you're interested in trying this technique (or have one of your own), read on. As a photographer of birds, they're not always cooperative. However, some birds are good subjects for this (as well as other subjects), particularly those that are bit slower to move, the observers, waders, etc. 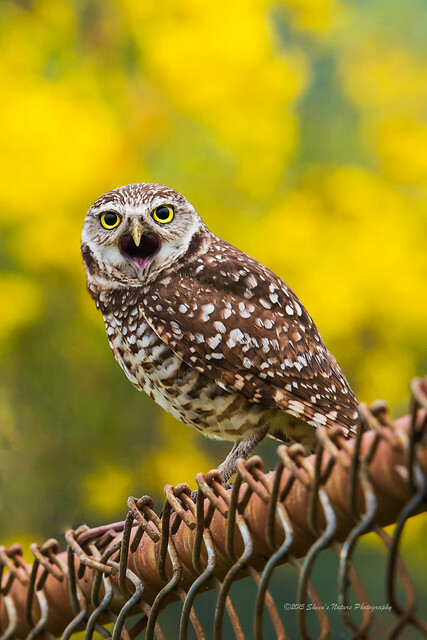 The example below uses 2 burrowing owls perched on an old rusty chain length fence. The first few shots focused on owl's eyes in the foreground. The next series zoned in on the eyes of the owl further away from the camera. I went back and forth as they moved around a bit. They would look around, preen, but if I shifted my position, they would look back at me for a few seconds. The key is to move only the focus points, not the camera. The same image, settings makes it much easier! The process is quite straightforward, it's the fine tuning that makes the difference. First open both files in Photoshop. Once you have both files opened, you can view the two files by selecting Window on the main menu, then Arrange, then 2-up Vertical. Second, using the move tool, move one image into the other file which will create two layers. From here, select both layers and do an auto-align, then auto blend which is accessed from the main menu by selecting Edit. Photoshop's intelligence aligned the two layers, then blended the areas in focus to create an image ready for processing (exposure, hue, cropping, etc.). Using the eraser tool, brush over the area not in focus. Erase the top layer to reveal the in focus bird in the underneath layer. In #3, only the head has been erased for demonstration purposes. After you've erased ‘in' your subject, some adjustments and corrections may be needed before the final post processing. The area erased out may have some contrast that is obvious. This is where using the cloning and healing tools can be used to blend the contrasting areas. Using either Photoshop, Adobe Camera Raw, Lightroom (or other tool), process the image to your personal preference. I wanted to modify the yellow background a bit. I selected the owls in photoshop, inverted the selection to work with the background and slightly adjusted the exposure with a slight push of the slider. The final image is below. This takes practice both in the field and in post processing. You can start with stationary objects or just dive in with your favorite subject. 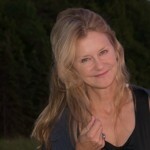 Sheen Watkins is a bird, nature, wildlife photographer and photography writer. You can follow her photography on Facebook, Instagram and her website. A long term birder and nature enthusiast she is Vice President of Saving Birds Thru Habitat, a non-profit organization dedicated to educating others about the importance of protecting our natural habitat for migrating birds. She also has a travel and photography blog.